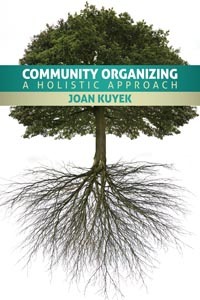 The strength of this book comes from Joan Kuyek’s perspective, informed by over 40 years of organizing. Initially intended as an update of Fighting For Hope: Organizing to Realize Our Dreams, which Kuyek wrote in 1990, it has instead become a book that reflects both the changes in the world and Kuyek's learning over the last two decades. Kuyek’s political experience is rich and deep. It began in the 1960s, when she did research for the federal government’s Company of Young Canadians program. What she learned there quickly transformed her interest towards participatory democracy and community action. She did community organizing in Kingston, where she dedicated herself to the women’s liberation movement and was elected as a city councillor (“alderman”). Later came various organizing in Sudbury, and then national work with the United Church’s “The Church and the Economic Crisis” project and the Urban-Rural Mission with the World Council of Churches. She then went back to Sudbury to work as the founding program coordinator of the Better Beginnings Better Futures community development program, followed by a year with the national Urban Issues Program of the Bronfman Foundation. She then helped found MiningWatch Canada, where she stayed for ten years. Community Organizing: A Holistic Approach is indeed holistic and comprehensive. Kuyek examines the creation of positive social change based on a coherent and wide-ranging analysis of the context in which the work is done and the principles needed to make it effective. Her concept of a holistic approach draws on Aboriginal ‘medicine wheel’ philosophy, in an effort to bring balance to the various aspects of organizing. She notes, “whole chunks of experience and information are often missing from our work.” She uses stories from her own history of involvement to illustrate the holistic approach, which add much to the principles and analysis contained in the book. Perhaps the most important part of the book is her perspective on starting points for effecting real change—by which she means changing the societal systems that perpetuate problems, and not just winning piecemeal victories. It is not, as she would have argued earlier in her life, on environmental, social or political questions that we must begin our organizing. Instead, she offers a gardening analogy, of creating fertile soil from which good things can grow. Kukey finds hope and inspiration in First Nations communities, where the maintenance of traditional ways of life has gone hand in hand with improvements in social, political and economic life. Having outlined the many problems with our current culture, she finds it necessary for non-Indigenous people, too, to undertake a radical transformation of our cultures and communities. And along with this type of coherent vision, she provides many principles and tools: a list of conditions for how to create safe learning environments, "the web of influences" exercise, questions for visioning exercises, activist theatre, media resources, and more. This book is really a toolbox, a strategy-box, and a vision-box, all in one. Kuyek clearly illustrates how we can either meet or fail the challenge of class or race, and its impact on our organizing. She’s also able to communicate a valuable understanding of subtleties in discussions on different aspects of power and economics, both of which are often insufficiently or problematically discussed or investigated in activist efforts. Kuyek has much wisdom to share: frankly acknowledging the problems of fragmentation and disunity in organizing; explaining why developing a sense of “we” based on vision and values is better than organizing based on defining “enemies”; and learning to welcome how synchronicity seems to play a supportive role whenever we’re doing the right work. For someone interested in getting involved in organizing, this book can serve as a comprehensive and inspiring introduction. For those already committed to this work, it is a valuable resource for reflection and guidance. Greg Macdougall is an educator, activist and writer in Ottawa. More of his writings and work are online at www.EquitableEducation.ca.